Olivia Palermo has us seriously in awe with her Christian Dior front row get-up. She wore a striped dress, quilted burgundy bag and shoes all from the Spring 2013 ready-to-wear collection. Staying stylishly warm, the fashion maven styled out the cold snap in a black Felder Felder coat teamed with crimson lips and a fuss-free updo. Leigh Lezark brought a flash of colour to the front row opting for a fluoro pink mini, matching clutch and classic Chanel pearls. Jessica Alba wowed on the front row of Shiatzy Chen in this electric blue silk kimono style mini-dress by the designer. Adding a fashion-edge to the look, Jess worked the only 'do to be seen with over Fashion Week - the top-knot. Perfect! The gorgeous Milla Jovovich worked a classic Chanel look front row at the Autumn Winter 2013 show. Lee Lee Sobeiski looked chic and laid-back working a tomboy look at the ADAA Art Show Gala. 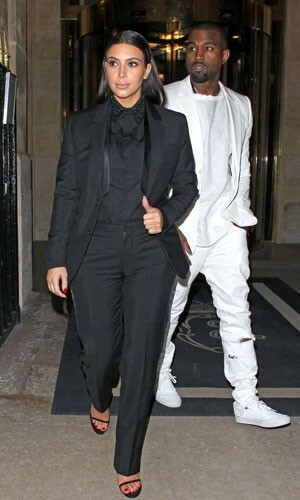 Kim Kardashian and Kanye West proved they're a couple truly in sync in the style stakes, wearing complementing black and white outfits at Givenchy's Autumn Winter 2013 show.